- Slice the apples and place in an 8”x8” dish (or something of comparable size)…. - Mash the banana with the almond butter, lemon juice, cinnamon, and salt and pour over the apples…..
- Stir together until you get a gooey apple mixture like so….. This post has been linked to Slightly Indulgent Tuesdays @ SS & GF. Also, this post has been added to Sugar Free Sunday. 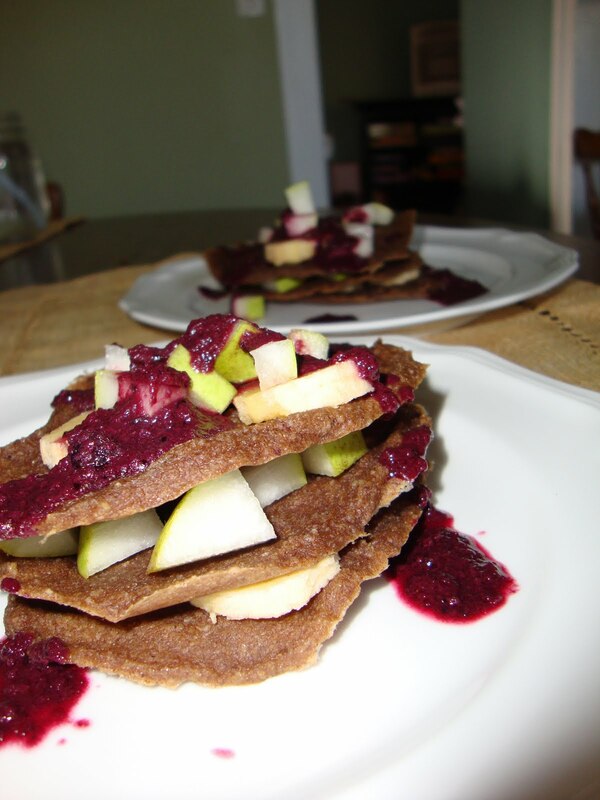 Check out this site on Sunday's for some refined-sugar-free yumminess! I think I have mentioned before my love for Thai food. Well, before there was Thai, I had another food-love: Moroccan food! I haven't made anything Moroccan inspipred lately so tonight I decided to make a side dish that was sort of like Moroccan couscous. I chose millet, but this recipe could easily be made with couscous as well. - In small saucepan heat the oil. - We had ours with Mahi-mahi fillets topped with Limnos Lamb Rub from Savory Spice Shop to complete the Mediterranean-themed dinner! So not too many posts this past week. We have some crazy things going on in our lives. You can read about them here on our personal blog if you like. - Repeat layering until all ingredients are used. This post is a part of Slightly Indulgent Tuesday's @ SS & GF. Check out more recipes there! So I just recently purchased a dehydrator! It was prompted by a visit to a raw restaurant in Atlanta called Lovin' It Live. We were both so in love with the food (which is saying a LOT for my husband!) that we thought we needed to purchase a dehydrator to be able to make similar things at home. As it turns out we don't think they dehydrated anything at Lovin' It Live, but still I'm glad we purchased this. We used our Bed Bath & Beyond coupon for the 20% off, but I found out you can get this one- which is comparable to ours-- on Amazon. All that to say that one of my newbie dehydrator experiments has been trying to get a good grain-free, low sugar granola! 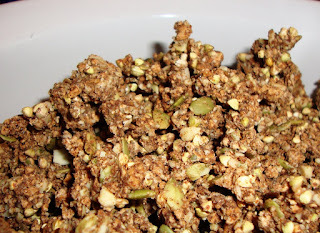 Well, I feel as though I have gotten a pretty good Grain-free Granola 1.0 version going so I am going to post it. But I will definitely be playing around with this one, and possibly creating a version with coconut sugar soon. - optional: coconut flakes, buckwheat groats (pseudocereal/grain, not a true grain- these give an extra crunch to the granola), raisins, other dried fruit- the possibilities are endless! What you see pictured has buckwheat groats in it but no coconut. 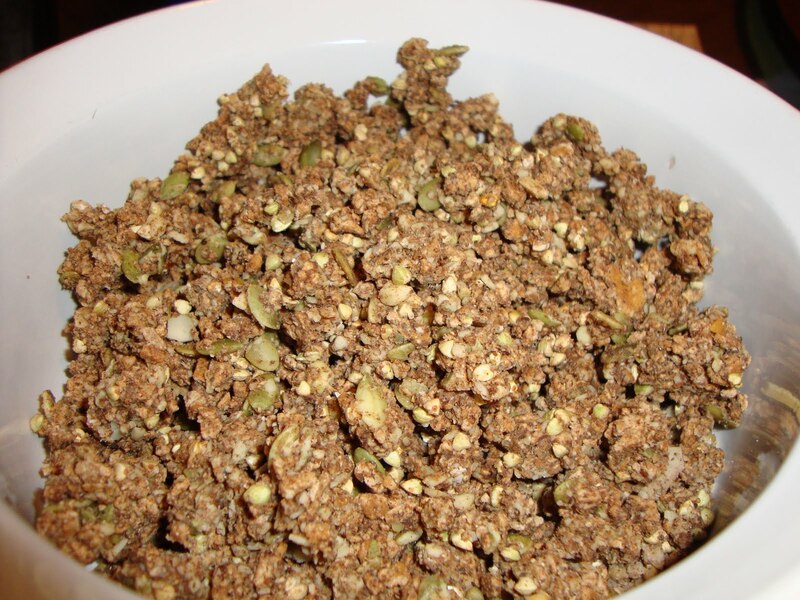 - Mix the fruit mixture with the nut mixture in a bowl. 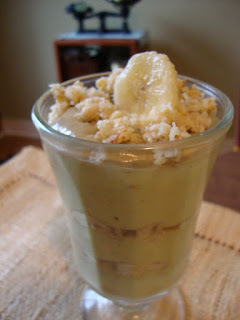 The mixture should resemble a crumble topping (moist, but like what would go on top of an apple crisp before it’s baked). *NOTE: If you do not have a dehydrator, you may be able to make this in your oven set at it's lowest setting (probably around 135-150). The drying out time will probably not take overnight as well. If you try this- let me know how it goes! I'm a big custard lover. Especially for breakfast. If ice cream were high in protien, fiber, and low in refined sugars and empty calories (and while I'm at it- dairy free! )- I would eat it every morning for breakfast! Lately, I have been thinking about my love for a particular custardy, breakfast treat- rice pudding (or porridge as it's sometimes called). When we lived in Fort Collins, we would go to a quaint little New Orleans inspired breakfast place called Luciele's. 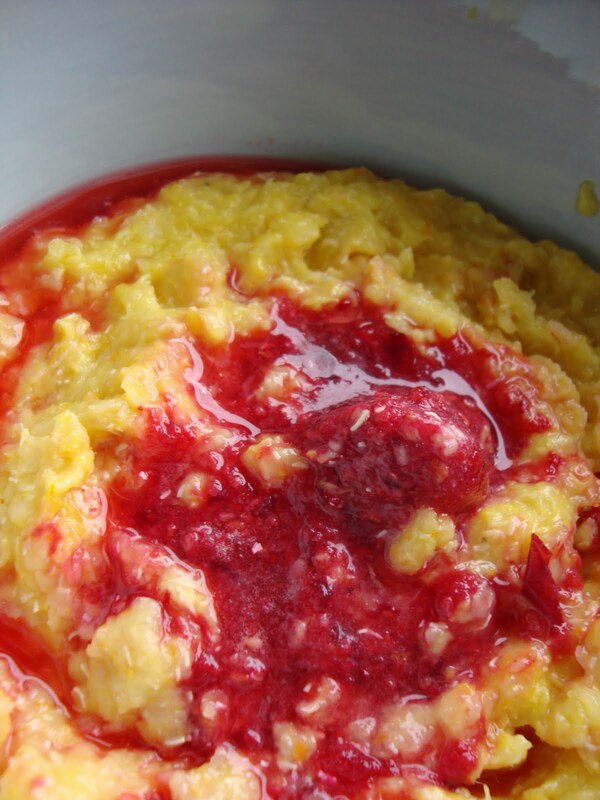 One time, while there with friends, someone told me to get the Rice Pudding Porridge, which had hints of orange/ citrus and came topped with raspberry sauce, currants, and cream! It was heaven. I could not eat that if I ever got the chance to go to Luciele's again, because I now know that I am pretty allergic to dairy....bummer! I don't know why but the craving for orange and cranberry comes to me sometimes and I just have to figure out a way to make it! 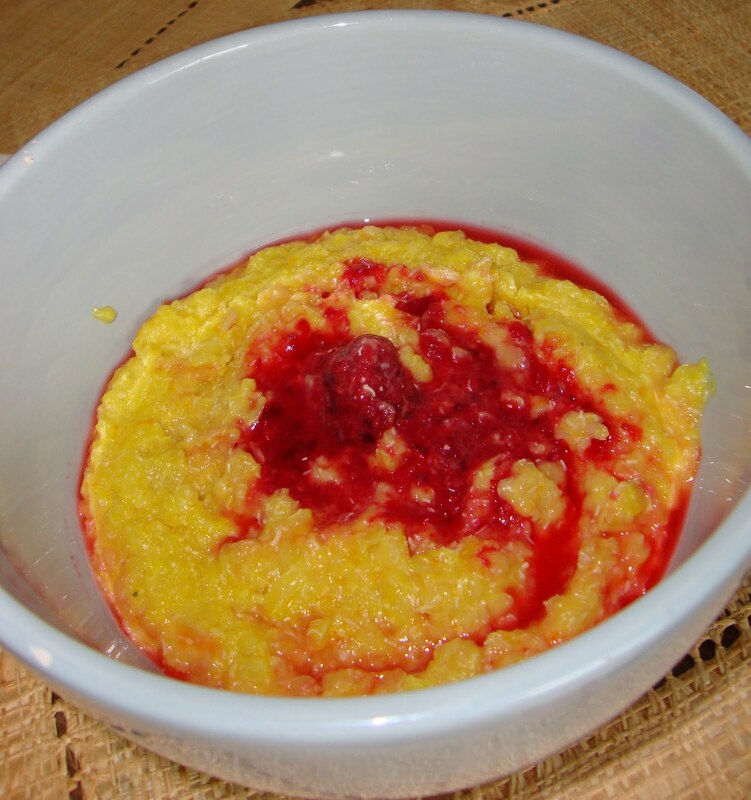 I also wanted to recreate Luciele's recipe without eggs or any dairy products (kind of hard to do since those two things are in the definition for "custard"!). 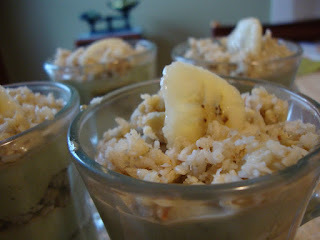 But coconut milk and Quinoa flakes (descent source of protien, iron, and fiber) saved the day! Coconut milk provides the richness that dairy cream does, and quinoa flakes, similar to cream of wheat when cooked, provide the thickness and puddingyness (simply for lack of a better word:) that eggs would have. - Zest the orange into a food processor or high powered blender (I use a Vitamix), then peel the orange- removing the pith- and discard the peel. If using a food processor de-seed first as well. If desired, you can add 1/8-1/4 banana for a sweeter pudding porridge. Blend until the orange is pureed, and add enough coconut milk to make 1 cup total liquid when combined with the pureed orange. Blend with a pinch of salt. - Transfer the 1 cup coconut milk/ orange/ zest/ salt mixture to a pot and heat on medium until it begins to boil, then turn down to low. - Puree equal parts of frozen raspberries and cranberries together in a food processor or high powered blender with about 1 tsp lemon juice per cup of berries. o TIP: I do this in a big batch (because I know I eat this a lot now! )- a cup of raspberries and a cup of cranberries at a time, then I freeze the mixture in ice cube trays to have on hand. When my pudding porridge is ready, I just pop a couple ice cubes on top and the quinoa pudding is hot enough to melt them right away. If you are just making this one time, I would just macerate a Tbsp of each raspberry and cranberry with a dash of lemon juice. This can be done with a fork, potato masher, or pastry blender. 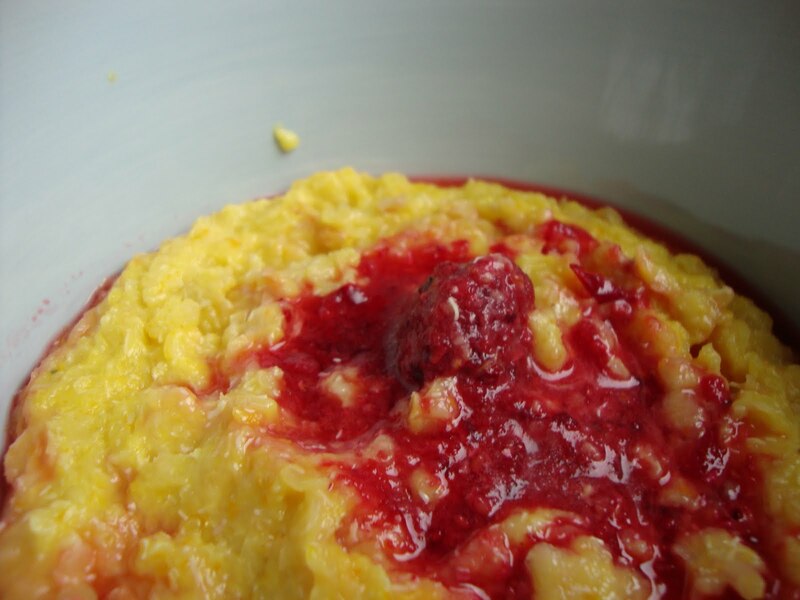 - Top the quinoa pudding porridge with the berry mixture and enjoy! - Make her recipe as directed (and make above substitutions for sweetener-free, if you like). But stop before you spread the mixture into the greased pan. - Then, reserve 1/3 of the batter in another bowl while you spread the remaining 2/3 of the batter into a 8"x8" glass baking dish. - Puree 1/2 cup of berries of your choice (I used strawberries and raspberries) with 1 tsp lemon juice. Then spread this over the 2/3 batter in the pan. 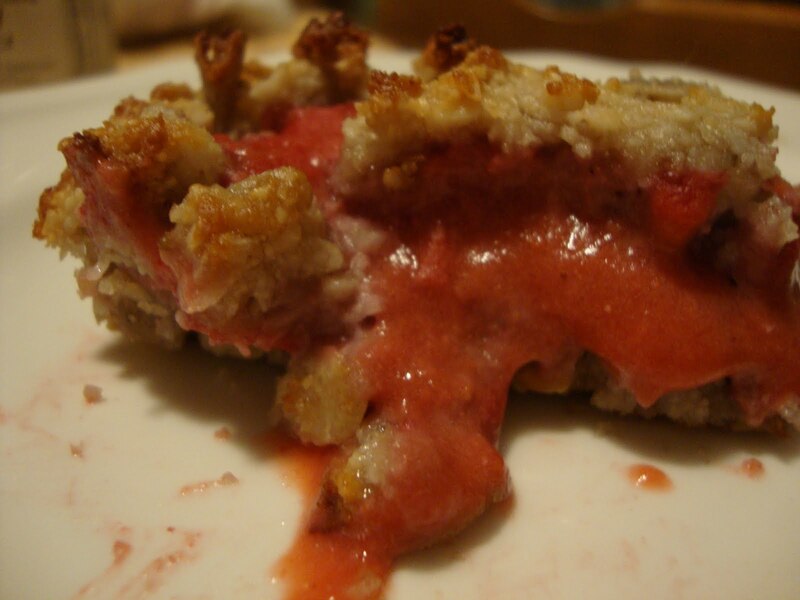 - Top that by sprinkling the reserved 1/3 batter, pinching it onto the berry mixture. - Bake at 325 for 25-35 minutes until browned on top. 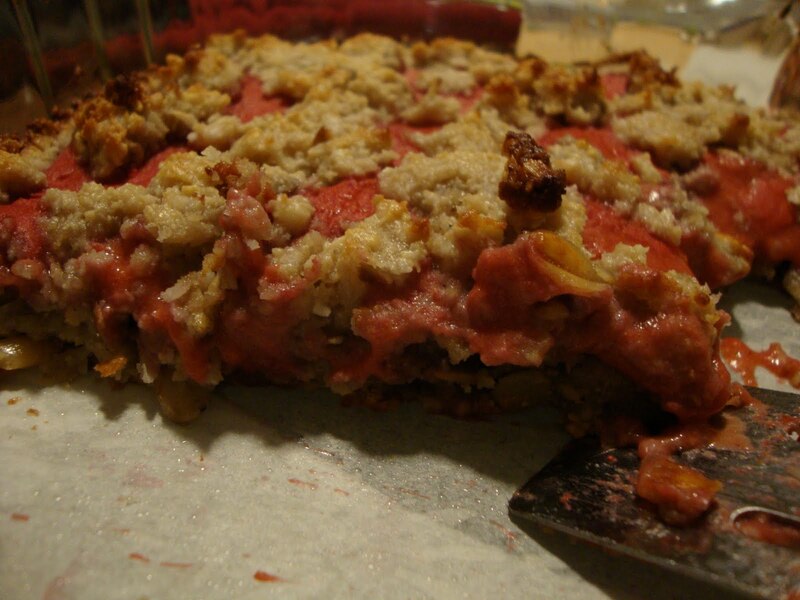 - The berry mixture will congeal after a while. In the pic above, it's a little runny because it was straight out of the oven- I couldn't wait! This post has been linked up to: Slightly Indulgent Tuesday's at SS & GF. 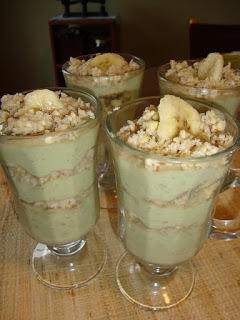 Don't forget to stop by and see what everyone is brewing up for healthy inspirations! So, I'm not sure how often I will review cookbooks on here since me and cookbooks rarely get acquainted with one another. Now, I'm not dissing cookbooks AT ALL! But I think I'm just so particular about what I'm wanting in my head that I can hardly ever find it in a cookbook that I have at home. And I know the ones I have bought rarely get used. But- recently I have gone through a lot of my cookbooks....from Great Mamaw's hand-me-down early 19th century ones to Rachel Ray's most recent...so cookbooks have been on my mind lately! 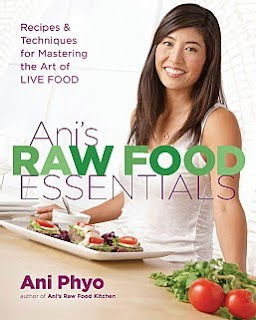 Anyways, so I did find a steal at Borders for Ani Phyo's newest book, Raw Food Essentials Cookbook (40% off!). I have noticed this cookbook before, whenever my husband goes to Barnes and Noble or Borders and I just find myself in the "Special Diet" section looking for new healthy things to try. Of course, on a student budget- this book has been off limits. But at 40% off (and the fact that I am now working :), I got to snag it up, and man am I pleased! This morning for breakfast my husband and I made the Banana Brazil Nut Pancakes with fresh banana, pear, and Ani's Blueberry Jam (we omitted dates and put a pinch of banana in instead). And we had these things syrup-less and they were yummy! Last night we had Hawaiian Pizza. This recipe was in her book, but we made it "mostly raw" adding some cooked smoked zucchini and rutabaga (her recipe calls for some yummy coconut meat "bacon", but we didn't have the time to dehydrate any). We made her Marinara Sauce (and added a few extra sundried tomatoes), spread that on a flax-seed pizza crust, added her Basic Cheeze, and topped with pineapple and zuchini and rutabaga that were fixed like these Chipotle BBQ sweet potatoes. I am not eating all-raw anymore; however I do feel like I felt more energetic eating all raw so I am trying to fix us a couple raw meals a week. My husband is eating mostly raw right now (just nuts, seeds, fruits, and vegetables) as well (for health reasons- under the direction of a doctor/ nutritionist). So it works out that I just got this cookbook because of our need for more yummy raw recipes! I hope you will check her website and cookbook out. She makes it simple to incorporate more raw in your diet. Her recipes are flavorfull, yet very few ingredients. Many of her recipes require a dehydrator- but she gives directions for attempting to dehydrate in you oven if you don't have one. Also, most recipes can be made if you have a food processor, but it probably helps to also have a Vitamix or Blendtec. 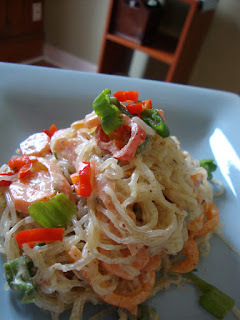 When I was eating all raw (for health reasons, for a short period), I discovered raw kelp noodles. I can get them from my local health food co-op, Life Grocery here in Marietta, GA. Now some of you right now may be thinking- "seaweed?...gross!" Not so with these kelp noodles! They have virtually no flavor and, therefore, easily can be created into any popular noodle dish when trying to go lower-carb. 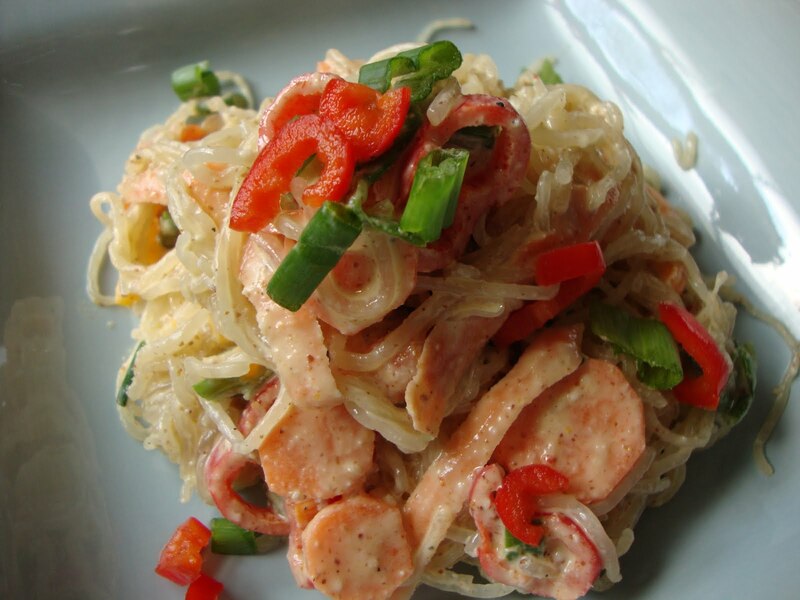 And they have the perfect texture and shape for noodley dishes like Pad Thai. Nutritionally- kelp noodles are power packed. They are rich in around 70 minerals (like iodine, magnesium, potassium, calcium, iron), trace elements and enzymes. Also, kelp is a natural antibiotic because of it's iodine content, and can help the body fight bad bacteria and infections. Iodine is also good for correcting the functioning of the thyroid gland, which regulates metabolism (. Kelp noodles are slightly salty, naturally. In fact, some cultures don't even use salt (can you imagine that, my fellow Americans? ); they use sea vegetables in flake or powdered form to "salt" things! If you have homemade or store bought raw almond butter around (or if you have a roasted version if you don't want to go all raw with this) and my Thai dressing, this recipe can be made in no time at all. - The kelp noodles may clump together, so I recommend getting a big bowl to spread them out in. Once you have de-tangled them a bit, mix half the almond butter/ dressing mixture with the kelp noodles. - You can serve right away, but I think it tastes better after it sits and marinates for about 15-30 minutes. - Serve in individual bowls or plates and top with crushed cashews. 1. 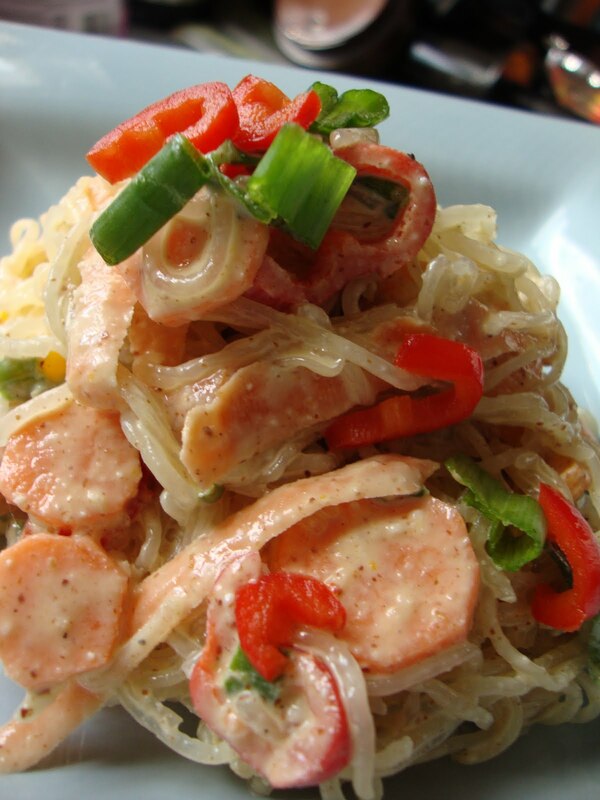 Use 1/2 box Thai rice noodles- prepared according to package directions and make the rest of the recipe the same way. 2. Or add chicken that you marinate in the Thai Dressing and saute to this dish as well. Thai food is quickly becoming my favorite. I love spicy...and a little sweet with the spicy is even better! This dressing goes well with salad's and I use it in my Raw Pad Thai recipe as well. - Mix all ingredients but the oil in a food processor or high powered blender. - Then drizzle the olive oil in while machine is running (if using a Vitamix, set machine to speed 6). Make sure to pour it slowly so the dressing can properly emulsify. "Sugar free". "Reduced sugar". "Refined sugar-free". "Made with all natural sweeteners". There are a lot of "labels" out there with regards to white, refined sugar alternatives. I was on the hunt for chocolate at my International Farmer's Market the other day, and I thought I could find "just dark chocolate" (with no sugar added). So I bought some "sugar-free" chocolate (and yes, I read the label which said the only ingredients were cocoa butter, cocoa liquor, cocoa nibs, and non-GMO soy lethicin). "Great!" I thought, BUT it had in small print at the bottom (which I read post-buying the product) an excerpt about how it's sweetened with Maltitol, which is a sugar alcohol derived from corn! Since Maltitol has no nutritive value, it doesn't have to be listed in the ingredients list!!!! I don't know a lot about possible negative effects of this sweetener; however, I try to not eat sugar alcohols because they are chemically processed ingredients and I want to eat things I can understand! - Agave nectar (at least the way it is sold in stores) is a “processed” food- meaning it has to be processed to be sweet (hydrolyzing the polysaccharides usually by thermal hydrolysis (meaning temps of 160+ or more). If it’s not processed by hydrolysis, then it’s not sweet- therefore, the question begs can it really be “raw”? 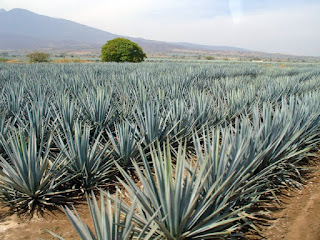 - Also, the processed product of the agave plant we eat is very high in fructose. Fructose alone is not a monster by any means (I know we think of it that way because of High Fructose Corn Syrup—which now the evil food conglomerates are petitioning congress/ FDA to rename it “corn sugar” for a while until the public catches up!...I digress). But high fructose intake (which some agave syrups can be almost all fructose- 98%) is linked to a number of not-so-good things: diabetes, obesity (fructose converts to fat more easily than any other sugar), malabsorption, and even high blood sugar! Fructose is harder on the body to process because it must be processed by the liver, whereas glucose can be processed by every cell we have in our bodies. - Agave, because it is processed, even if it says “RAW” (which there are no FDA regulations on what “raw” has to mean if it’s not a vegetable, fruit, or animal product), contains very little of the nutrient benefits of it’s parent plant. 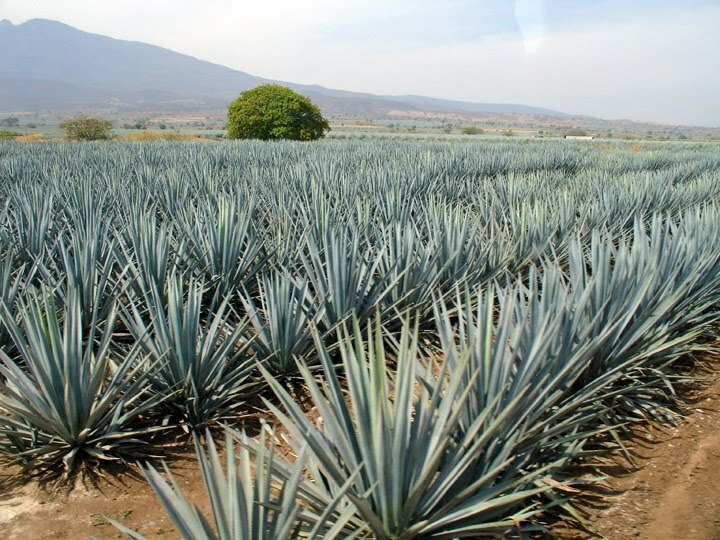 - Although this cannot be confirmed in the major brands, imported Agaves have been thought to have additives like corn syrup in it to make it more profitable, and the corn syrup can easily be “snuck in” across the border. - Honey is a “whole food”, meaning it contains vitamins, enzymes, amino acids, phytonutrients, etc. - It is lower in fructose than Agave, and usually has a 1:1 ratio of glucose:fructose. 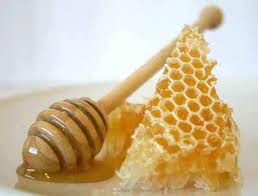 - Raw Honey may also have anti-microbial, anti-fungal, and anti-viral benefits. - Many of the anti-inflammatory benefits/ enzymes/ Vitamins are reduced significantly when heated, making it similar to Agave when used in baking. The best place to find raw honey is a local beekeeper. Savannah Bee Company has nice raw honeys, mostly grown in FL or the North, though- but they are sold across the South in specialty shops. Whole Foods also has local honey companies products and most often, raw honey from at least the regional area. Localharvest.org is another good way to find local honey in your area. - If you want to support small farmers, coconut sugar is the way to go…this is a highly sustainable product…. - It’s loaded with vitamins, essential amino acids, etc. 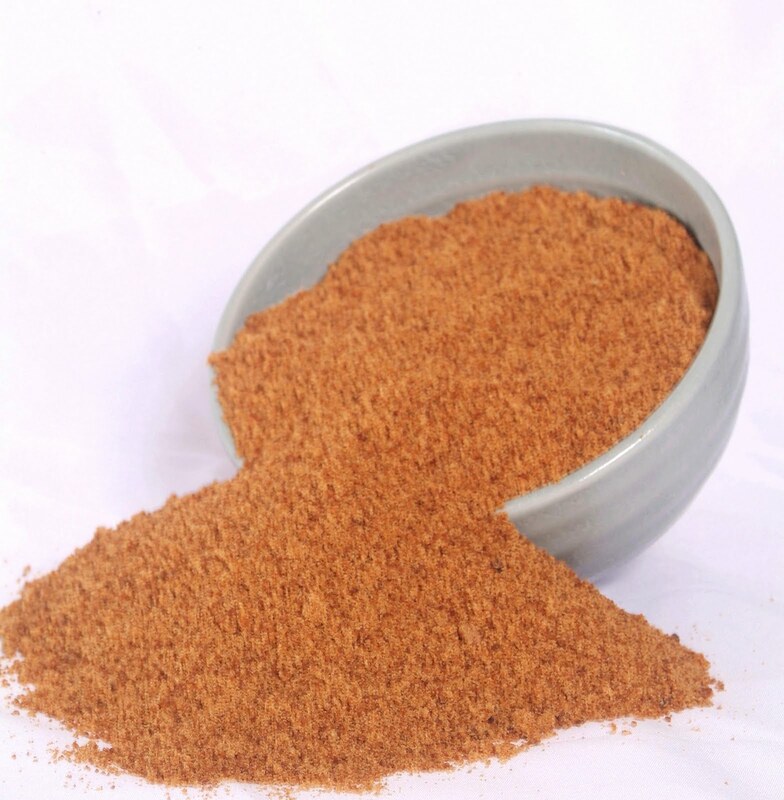 Coconut sugar can be found at Whole Foods (I have not seen it in local grocery stores yet). It can also be purchased for a reasonable price at iherb.com. - A unique “maple” flavor, ideal for candy making, maple flavored desserts, or a breakfast topping. - If you buy Pure Maple syrup (or Grade B), you are most likely supporting responsible, sustainable forestry and local businesses. - Grade B can sometimes have higher mineral content, adding minerals like calcium to your diet. - It is lower in fructose, thus, less hard on the liver to metabolize. - This stuff is pretty on par with regular sugar as far as the glycemic load goes- and sometimes is higher on the glycemic index than refined sugar per volume. This, therefore, would not be a good choice for diabetics or people with blood sugar problems. - It can be quite pricey if getting the Grade B kind in the grocery store. - Also, as with agave, this sweetener can sometimes be called “raw” but be wary of that label because, again, to have a sweet product some processing and, perhaps, some heating must occur. - Beware of regular "maple syrup" or generic brands in grocery stores: most of the time these are blended with 15% or more refined, white sugar! 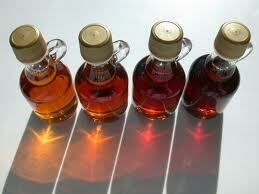 You can find Grade B Maple syrup now at most grocery stores. If you want a higher quality product, also try iherb.com. - Lowest glycemic index and load of ALL “natural sweeteners”, which is zero, making it an ideal sweetener for all! - It can be found in liquid or powder form, making it versatile for both baking and smoothies/ lattes/ etc. - Anything that your body perceives as sweet will trigger a release of insulin into your blood. If it actually is sweet (containing glucose- like honey, fruit, etc.) the combination of glucose and insulin in the blood will activate the satiety center of the brain (making you feel full). HOWEVER, if there are no actual sugars in what you are eating (like stevia or artificial sweeteners like aspartame), the insulin in the blood without the sugars being present will activate the hunger center of the brain. 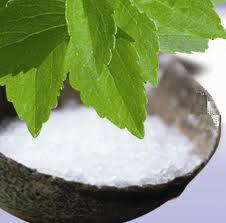 Therefore, stevia could promote hunger- leading to over-snaking! - Also, if some of you care- Truvia is made by Coca-Cola and PureVia is made by Pepsi. I try to buy brands other than Truvia and PureVia (for personal reasons), so I usually buy mine at Whole foods or my local organic co-op. It can also be found in more flavors in both liquid and powder from at iherb.com. - These would be my first choice (other than real fruits) to go to for a sweetener. - If not heated too high to dehydrate, they have all the benefits of their full-version fruits (vitamins, proteins, etc. ), just less water. - Also, many times white sugar is added to dried fruits (especially cranberries)- so read the labels! You can find dried fruits at a plethora of places. I recommend making sure they are organic and looking into how your favorite brand is “dried” to see how high it has been heated to dehydrate. 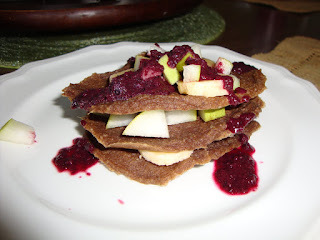 Sweetener Free: see my recipe index and be waiting for upcoming recipes using whole fruits as a sweetener!